A one of a kind artisan designed piece, a wonderful piece with a French antique C1890 Art Nouveau repousse Notre Dame de Salette Souvenir Photo Locket Book with photos of this glorious place. This piece is quite collectable, a rare find indeed. The reverse side has a Floral Cartouche. There are a total of 8 photos inside. Both sides have a raised relief. This piece is in Excellent condition for the age, the photos are very well preserved. 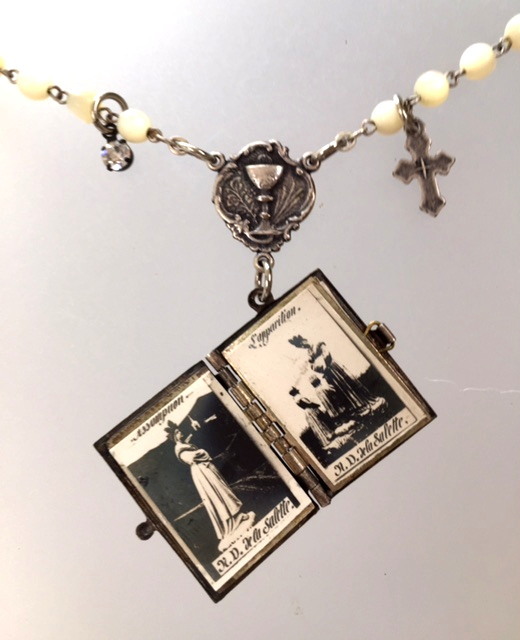 The pendant is hung from a First Communion Rosary center with stunning antique French Mother of Pearl Rosary Beads completed with crystals, and I added a Silver Cross and single Rhinestone. The communion medal has "In rememberance of my First Holy Communion" on the reverse. The ornate toggle closure has a silver Sacred Heart Charm with a French inscription. Mother of Pearl beads measure 18.5" Long; book is .75" by 1".